At the Principal Annual Sale of Cheviot Mule Ewe Lambs and Gimmer Shearlings held at Longtown on Tuesday 24th August 2010, there was a large ringside of buyers from across the UK for a good quality and increased entry of sheep. 1,234 shearlings averaged £117 and were topped at £202 for a smart pen of 20 from G.B. Milroy, Mains of Machermore, Newton Stewart, bought by R. Stevenson, Howgillfoot, Kirkby Stephen. Other shearlings sold to £156 from H. Cockburn & Partners, Kingside, £155, £150 Mrs L. Sloan, Ryemuir, £150 J.T. Fleming, Falnash and W. Fotheringham & Son, West Hall. The 2,324 ewe lambs averaged £97, up £15 on last year. 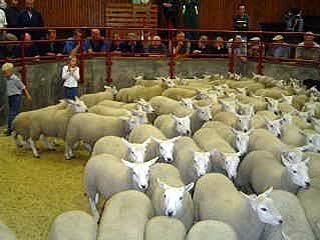 The North Country Cheviot Mule Lamb section was topped twice at £130, firstly by M.A. Hedley, Overacres, Otterburn, sold to W. & J. Brown, Hilton of Culsh, Aberdeenshire, and secondly by M. Aynsley & Son, Wardshill, Morpeth, sold to W.R. Williams & R. Ioan, Ty Hen, Gwynedd. Overacres also sold at £128 (twice), £124 and £121 and averaged £119 for £156 head. Wardshill also sold at £123 and £122 (x3) and averaged £113 for 427 head. Philiphaugh Estate sold to £124, as did W.A. Crozier, Embley, with H. Cockburn, Kingside topping at £123. 271 head from R. King & Sons, Gospel Hall sold to £121 and averaged £112. Corriehills sold to £111, Terrona to £108 and £104, Clifton on Bowmont to £100. The Hill Cheviot Mule section was led by J. Common & Sons, Crossdykes at £118 and £105. Tushielaw to £90 and £84, Carterton to £81 and 80, Gilmanscleugh to £80. Texel cross Cheviot Mule ewe lambs were at £110 and £92 from Wester Ulston. The Cumberland & Dumfriesshire Farmers Mart P.L.C. had forward 4,021 Store Lambs (including 211 ewe lambs) at their weekly sale at Longtown on Tuesday 24th August 2010. A larger show saw more buyers from a distance and all classes again at extreme rates. Top of £69 and £68 for Texels from Underbank, £64.50 Hazelbank; Beltex £65 Middle Farm; Suffolk £64 Milnholm, £62 Hazelbank; Greyface £63 Roachburn, £60 Harsondale; North Hill Cheviot £60, £59 Hownam Grange, £54.50 Kelsocleugh; Charollais £57 Haswellsykes; Blackface £50 The Row. 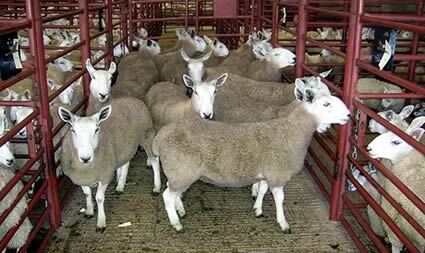 Ewe lambs to £81 and £71 for Suffolk cross Mules from Fountainside, others £67 Haswellsykes; Texel Mules £67 Greensburn.